George C. Platt - 6th United States Cavalry, Troop "H"
George C. Platt, 6th United States Cavalry, Troop "H"
George Crawford Platt enlisted in the 6th United States Cavalry, Troop "H", on 5 August, 1861, and was discharged on 6 August, 1864. Wounds received during the war include a saber wound to the head, a ventral hernia, and gun shot wounds to the groin, knee and leg. He was awarded the Medal of Honor for service during the Battle of Fairfield, Pennsylvania. He was a one-time President of the Survivors of the Sixth U.S. Cavalry Association. He is also the namesake of the George C. Platt Memorial Bridge located in Philadelphia, Pennsylvania. His award citation and a description of the Battle of Fairfield, Pennsylvania, follows. RANK AND ORGANIZATION: Private, Troop "H", 6th United States Cavalry. PLACE AND DATE: Fairfield, Pennsylvania, 3 July 1863. ENTERED SERVICE AT: 6 Aug 1861, Philadelphia, Pennsylvania. BIRTH: 17 Feb 1842, Londonderry, Ireland. DATE OF ISSUE: 12 July 1895. SERVICE AT GETTYSBURG: On July 3, the 6th U.S. Cavalry rode to Fairfield, Pennsylvania, to investigate the report of an unescorted rebel wagon train. North of Fairfield, the Union troopers became engaged with the 7th Virginia Cavalry. The Virginians were easily repulsed. A second Confederate assault by General William "Grumble" Jones' Cavalry Brigade (including the regrouped 7th Va.) overwhelmed the 6th U.S. and soon the fight degenerated into isolated clusters of men in hand-to-hand combat. During this, the color bearer of the 6th U.S. was shot down. Private Platt appeared and rescued the flag. Platt '...tore the color from the staff, placed it in his bosom, and rammed the staff through the first enemy that came before him, and then cut his way through the ranks of the enemy." 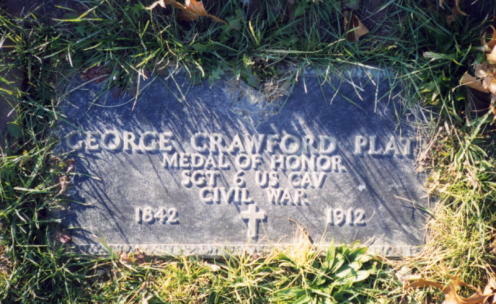 The 6th U.S. Cavalry was defeated and suffered 242 casualties, but Private Platt and the unit's flag survived. OTHER SERVICE: Served a 3-year enlistment, promoted to Sergeant, participated in 49 battles. PLACE OF BURIAL: Holycross Cemetery, Yeadon, Pennsylvania. George C. Platt called to his commander to rescue the flag, and charged the mass of Confederates who had partly succeeded in taking it. He was followed by James McDowell and half a dozen others. McDowell was cut down and fell in the road and the man who cut him down, lowering his sword to a front cut rushed at Platt. Platt went for him with a carte point and dumped him in the road beside McDowell. Platt then rushed into the melee, seized the flag, and got away with it. Our men in the meantime having opened fire on the Confederates and thrown them into confusion. In the encounter the flag was broken from the top of the staff and was taken off by Platt, and he has it now as a memento of July 3, 1863. Of the squad that followed Platt in rescuing the colors, all went down killed or wounded and he himself was badly cut. Companion Platt was also wounded at Williamsburg and Malvern Hill. He was born in Ireland February 17, 1842 and enlisted in H-troop 6th U.S. Cavalry August 5, 1861. He served until nearly the close of the war and participated in nearly fifty battles and skirmishes. Companion Platt is married and has quite a large family of children. His medal will be inherited by his daughter Mrs. Lydia Griffin. As they moved toward Fairfield, no one new that red-letter day in the history of the 6th Cavalry regiment had arrived; for, after leaving the bivouac, and being detached from the main column, they were to go down to defeat against overwhelming odds, but without dishonor. The regiment reached Fairfield at noon, detaching two troops to proceed along the base of the mountain, the rest of the regiment keeping the road to Gettysburg. About a mile from Fairfield, the enemy's pickets were encountered and driven back to their supports. A squadron of the Seventh Virginia Cavalry came up and was driven back to forks of the road from which their main body could be seen, consisting of about four regiments of cavalry. Clue's Virginia battery opened on the regiment as soon as the wreck of the Seventh Virginia cleared the way. The regiment was close enough to hear the command, "draw sabers!" of the enemy, as they were formed for the charge. The two advance squadrons of the Sixth were in between post and rail fences, and could not form a line or join those in the fields before they were charged by the Sixth Virginia Cavalry, supported by the Confederate brigades under Generals Robertson and Jones. Caught in such a trap, the men remained firm, firing and inflicting severe loss on the advancing column, until literally ridden down. Some escaped to the fields and made for the town, but the Confederates got there first. Lt. Balder, who was ordered to surrender, called on a few men near him to follow, and had nearly cut his way out, when he fell mortally wounded. The squadron which was on the road near the mountain was also overpowered and hurled back. The regiment lost Lt. Balder, killed; Major Starr and Lieutenants Tucker, Wood and Chaffee, wounded; Captain Cram, Lieutenants Bould and Paulding, and surgeons Forwood and Notson, captured. The loss of men was 232 killed, wounded and captured, out of a total of less than 400. Lt. Bould later managed to escape and Captain Cram was paroled. At the moment when the charging column of the enemy encountered the head of the regiment, the standard-bearer was shot dead. As the Confederates were about to seize the standard, some of the Sixth cavalrymen charged into the melee. Sergeant George C. Platt rescued the standard and, sticking close to the fence, put spurs to his horse, dashed past the enemy and escaped. The slashed and torn emblem, for which so many men had fought and died, remained in the hands of the gallant little remnant who had followed it on many hotly contested fields. Sergeant Platt was later awarded a medal of honor for his distinguished bravery. The fight made at Fairfield by this small regiment against two of the crack brigades of Stuart's cavalry, which were endeavoring to get around the flank the Union army to attack the trains, was one of the most gallant in its history and no doubt helped influence the outcome the battle of Gettysburg. The efforts of these rebel brigades were frustrated and their entire strength neutralized for the day by the fierce onslaught of the small squadrons. The regiment was cut to pieces, but it fought so well that the squadrons were regarded as the advance of a large body of troops. The senior officer of those brigades was later adversely criticized for allowing his command to be delayed by such an inferior force. Had the regiment not made the desperate stand, the two brigades of Virginians might have caused grave injury in the Federal rear, before sufficient force could have been gathered in their front. Nearly all of the material contained in this partial summary account is extracted from Lieutenant Colonel William H. Carter's insightful book, "From Yorktown to Santiago with the Sixth U. S. Cavalry", State House Press, Austin Texas, 1989. Lt. Col. Carter, who wrote this book in 1900, was commissioned a Second Lieutenant at West Point (Class of 1873) and served with the Sixth from 1874 until his retirement as a Major General in 1915. The information presented here is intended for historical and educational reference only. Taken from the 6th U.S. Cavalry Regimental History at the 1st North Carolina Regiment of Cavalry homepage. One of the most pleasant reunions ever held on the Gettysburg battlefield, was that of the Sixth U.S. Cavalry. This event took place in the charming little village of Fairfield, some eight miles southwest of Gettysburg. The hearty reception these old veterans received there proved to each of them how well the citizens of Fairfield appreciate their work of twenty-five years ago, when at about noon Gen. Mead was informed by his signal officers that rebel Gen. Stewart was attempting to go around our extreme right, evidently for the purpose of destroying our ammunition trains, back of Culp's Hill and the two Round Tops, while, at the same time, a large confederate wagon train was moving from Cashtown back of the enemy towards Fairfield, on our extreme left, evidently trying to escape through one of the gaps into the Cumberland valley. Major General David McMutry Gregg, captain of Company E, Sixth U. S. Cavalry, was ordered to meet Stewart whom he defeated after a hard fight. Major Samuel H. Starr was ordered to take his Regiment, the Sixth U.S. Cavalry, and intercept or destroy the rebel wagon train. A rebel spy having informed some of our officers that this train was only guarded by mounted infantry. A farmer from the neighborhood of Fairfield was secured to pilot the command to its destination. When about two and one-half miles beyond Fairfield, on the Cashtown road, and, at the James A. Marshall farm, the regiment encountered the Seventh Virginia Cavalry. This regiment was not only repulsed but completely routed and driven back in the greatest disorder, leaving many killed and wounded on the battlefield. When unexpectedly from a little knoll beyond, Clue's Virginia battery opened fire, and the Sixth Virginia Cavalry charged down on the Sixth U. S. Cavalry, and they being dismounted, and having deployed in fighting the Seventh Virginia Cavalry, were taken at a great disadvantage, as most of them were unable to reach and remount their horses, and, as a result, it became a desperate hand to hand struggle, and although the Johnnies gained a victory over the Yanks, it was a victory through defeat, as their losses were almost four to every one of ours, and many were the instances where our men fought with desperation until death, rather than surrender, as was the case with Lieut. Christian Balder, of Company F. These heroic acts were witnessed by many of the people of Fairfield, hence their great love for the boys of the Sixth U. S. Cavalry. I said the old veterans were warmly received; Captain McGinley and Lieutenant Sefton met the veterans (as a citizen's committee from Fairfield) at Gettysburg and proceeded with them by the Western Maryland Railroad to Ortona where a number of wagons carried them to Fairfield. In the outskirts of the town a procession was formed and, headed by a drum corps, marched to the centre of the town, where headquarters had been established, and, after many warm greetings, the boys retired, as it was midnight. At nine o'clock A. M., July 3, the school bell was rung, and the veterans and citizens assembled in the public school house where an informal meeting was called by President Platt, who thanked the people of Fairfield in a neat little speech for their warm reception. Secretary Mueller followed by explaining the object of the preliminary meeting; namely, to go in a body over the battlefield. Mr. E. H. Vaughan, Secretary of the Sixth Virginia, being present, was by a unanimous vote welcomed and requested to accompany his old opponents over the ground, horses and wagons being in readiness. The ladies of our party having been taken in charge by a committee of ladies, and the old veterans by a committee of gentlemen, the party started for the field. When near the outskirts of the town the pleasure of the trip was somewhat marred by Comrade Henry Reitz being thrown from a very fractious horse. He was taken to the home of John Meyers near by, and Dr. Scott, of Fairfield, was called, who, after a careful examination, announced that, although the comrade was still unconscious, he was not seriously injured, and assured them he would take care of the patient while the party go over the field, and to which they reluctantly consented. Going over the field many narrow escapes and thrilling scenes were recalled and recounted. Arriving at the most advanced point in our lines, Mr. E. H. Vaughan, of the Sixth Virginia Cavalry, (who, by this time had been thoroughly satisfied that all the enmity of twenty-five years ago had disappeared from among the survivors of the Sixth U. S. Cavalry, as well as the citizens of Fairfield,) said: "Over yonder," pointing northward over a little slope, "we met the Seventh Virginia coming back in great confusion, many of them being wounded. On this ridge we formed; three guns of Clue's battery on each side of this road; after which Major C. E. Flourney, commanding our regiment, who had heard from the Seventh what regiment was in front of us, said: 'Men I want every one of you to do his duty; the men that you will meet are worthy of your steel; it is the Sixth Regulars, the best regiment the Yanks have.' This rekindled some of our fire for we did not feel very good after seeing the condition the Seventh was in, and we went in with a will and defeated you though you had already defeated and completely routed the Seventh. After we were formed, and just as our Major completed his remarks, John Allen, our Adjutant was killed in front of the regiment. We defeated you, that is true, but harder fighting we never did, nor heavier losses never suffered than on this field - in short it was a victory by defeat." On our way back to Fairfield our party had a photograph taken at the house of James A. Marshall, within thirty feet of where one of the Sixth Virginia and six men of the Seventh, (one a high officer), and nine horses were killed. A photograph was also taken of the group at the house of Colonel Swope, where Lieut. Balder was killed. The regular meeting was called to order by President Platt, of Philadelphia, at 3 o'clock P. M. sharp, with appropriate remarks. The minutes of last meeting were read and approved; the Secretary's report received and approved. Letters were received from nearly all the old officers of the regiment, expressing their regret for not being able to attend the reunion, and wishing the survivors prosperity and many years of happiness. The letters of Major General August V. Kautz, Colonel Samuel H. Starr, Colonel Robert M. Morris and Colonel Samuel M. Whitside, also containing the photos of the writers. These letters brought forth many complimentary remarks, especially from the respective companies to which the officers belonged during the time of the civil war. A large number of letters were also received from comrades who could not attend the reunion, and the Secretary was instructed to prepare answers to the letters of officers and others that was deemed necessary. President, SIMON NIXON, Butler, Pa.
1st Vice-President, GEORGE C. PLATT, Philadelphia, Pa.
2d Vice-President, H. T. SIBLE, Westerville, Ohio. Secretary, H. G. MUELLER, Allegheny, Pa.
Treasurer, JOHN S. THOMAS, Etna, Pa.
Standard Bearer, MARTIN SCHWENK, Washington, D.C.
Executive Committee: GEORGE C. PLATT, SID. M. DAVIS, THOMAS DODD. Butler was selected as the place, and July 4 the time to hold the next reunion. On motion adjourned to meet at eight o'clock P. M. for campfire. The Campfire was attended by over 500 people, making it necessary to hold the meeting in the open air, which meeting was opened by a heavy fusillade of very large fire-crackers. President Platt appointed Lieut. Charles J. Sefton, of Fairfield, master of ceremonies. Comrade Sidney M. Davis, of Washington, D. C., was then introduced, who compared the present with the past, giving the cause for the love which the members of the Sixth U. S. Cavalry have for neighborhood of Fairfield, and closed his remarks by saying: "And now a word to you, citizens of Fairfield; you have tried to add to our enjoyment, and you have succeeded. It was in the defense of our homes and our country's honor that we came here twenty-five years ago. We plunged in that conflict without a murmur and sustained it to the bitter end; the blood of a great many of our comrades sprinkled your streets and fields, while others went into a horrible captivity, where one-half of them left their bones bleaching at Bell Isle and Andersonville. Today we are here to commemorate that terrible struggle by a reunion. The small number here does not signify that your beautiful village is not always present in our heart of hearts. Ask a member of the Sixth U. S. Cavalry a question about Fairfield, and you will see his eyes gleam; he knows he gave his regiment and Fairfield a place in the history of his country, of which neither he nor the citizens of Fairfield, need be ashamed - that is the secret of his love for this beautiful valley." J. J. Lowden, of Boston, compared this meeting with that of twenty-five years ago, and closed his remarks with a poem written by a surgeon of the Sixth U. S. Cavalry, entitled, "Trooper's Life," and dedicated to commemorate the battle of Fairfield. James R. Newton, of Cleveland, recited a recitation entitled, "Progress," representing a dialogue between Warren of Old and Young America. Thomas Dodd, of Westerville, Ohio, recited "We Drank from the Same Canteen." E. H. Vaughan, of Halifax, Va., compared this meeting with many other meetings, but especially that at Fairfield twenty-five years ago, and finally was moved to tears by the kindness and courtesy shown and extended to him on his visit among us today. Lieutenant Charles E. Sefton, of Fairfield, also compared this meeting with that of twenty-five years ago. Simon Nixon summed up the causes that led to the war, the results that were obtained and the consequences that followed, all of which being well received and heartily applauded. Three cheers were then given with a will for the veterans of the Sixth U. S. Cavalry, E. H. Vaughan, of Halifax, C. H., Va., and three cheers and a tiger to the citizens of Fairfield. The old vets then tendered a vote of thanks to the citizens of Fairfield in general, and to Captain E. McGinley, Chas. E. Sefton and other citizens who had taken the most active part in arranging and preparing for the reunion. The outdoor exercises then closed, and the old veterans and citizens re-entered the schoolroom where ice cream and other refreshments were served. Captain E. McGinley acting as master of ceremonies. And we may close by saying that, although there were no Virginia fence rails to burn, we had a prisoner of war among us who, with his ready wit and general genial disposition, assisted in making everything pleasant, and all hands retired at midnight. On July 4, bright and early, everybody was up and about at seven o'clock. A number of vehicles were drawn up in front of headquarters, awaiting our pleasure to convey us to Gettysburg, and there over the battlefield and other places of interest. Arriving at the German Lutheran Seminary, we turned to the left, and entered the battlefield where Buford's Cavalry opened the battle on the morning of July 1, near the old Tape Worm (now Western Maryland) Railroad, turning into the woods and passing within twenty feet of the place where General Reynolds was killed. We charged on Major Louis Carpenter's (formerly of our regiment) command, and for the first time, an old officer of the gallant old Sixth was completely surprised, his command demoralized and routed, and the gallant old Major left on the field, a prisoner of war. He took his capture, however, philosophically, and behaved like an old tar; - beg pardon, like an old trooper. He was promptly court-martialed for being absent without leave, July 3, and I do not know what the sentence would have been, had he not clearly proven that his absence was due to the Secretary of War, who unmindful of his duty to an old soldier, had neglected to issue the proper order in time for the Major to reach Fairfield in time for the reunion. After a hearty and affectionate greeting to his old comrades, a gallant, though courteous, salutation to the ladies, and a few moments of social chat, we parted, allowing the Major to rally his scattered forces and so again become master of the situation, while we visited other points of interest. Arriving at the Seminary we soon found the plot allotted to those who fell in the regular service, and, standing at the graves of our former comrades, nearly all being marked "Unknown, Sixth Cavalry," none but a soldier can know the thought that filled our hearts. And, dropping a silent tear to their memory, we departed from the city of the dead, and after having visited all the points of interest, we parted in the evening with our friend, E. H. Vaughan, of the Sixth Virginia, who was actually moved to tears by the kindness shown him by his former opponents, and from our Fairfield friends, well satisfied with their generous hospitality. Allegheny, Pa., July 6, 1888.